Entertainment for all your guests from your FLOWER GIRL to your great grandpa! Entertainment for weddings is just as important to the bride and groom as making sure the wedding cake is striking, the food is delicious and your bridal party look amazing so why not do something different by having a casino at your big day? A wedding is a magical event anyway and a casino adds some glitz and glamour to the occasion. It’s something everyone can enjoy from your flower girl to your great grandpa, bringing together groups of friends and family who may not already know one and other. Having a fun casino at your wedding can act as a great way to break the ice and create an atmosphere of fun and excitement that can be enjoyed by the whole wedding party. Red & Black Casinos experienced croupiers will entertain your guests and are more than happy to explain the rules to anyone, whether they’re first time gamblers or just want to brush up on the rules. Red and Black Casinos provide a service that will be sure to make your big day a memorable one. The fun casino tables can be supplied as your only wedding entertainment or combined with music, dancing and more. whether you would like children to play on the tables or not. Below are some examples of when you may want to incorporate a fun casino to your festivities. If you want to know more, why not give Red & Black Casinos a call on 01394 380 988 or complete an online enquiry to find out how easy it is to bring the fun and excitement of a casino to your wedding day. Guests are always unsure how long you're going to be getting those lovely couples photos, so why not provide something to entertain your guest with while you're off in the grounds of your wedding venue. The tables will be a great way to getting all of your guests mingling and talking. 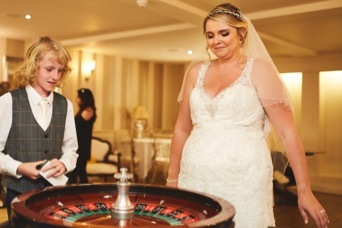 Having your fun casino straight after your wedding breakfast is another popular option, giving the days guests time to unwind before an evening of dancing commences. Your casino could run until your first dance allowing evening guests to play on the tables too when they first arrive. Not everyone wants to dance the night and provides another exciting activity to try. By having your fun casino in the evening all of your guests will get to enjoy the experience and be in the running to take home the prize (whether that's bragging rights or a bottle of bubbly)! Whenever you choose guests are sure to enjoy themselves and let their hair down in a safe environment. Red & Black Casinos only require a £25 deposit to secure your booking with the remaining balance not needing to be settled a month before your wedding day. Should you prefer you can spread the cost by paying by direct debit at no extra cost. Plus once you've secured your booking, if prices increase, you will still pay the rate agreed at the time of your booking. Red & Black Casinos regularly attends Wedding Fairs and Open Days within Suffolk & Essex, below are some of upcoming shows that Red & Black Casinos will be attending. Why not come along enjoy the venues hospitality met someone from Red & Black Casino's team and see the quality of their tables for yourself. If you want to bring all the fun of casino to your wedding day, complete this short form and someone from Red & Black Casinos will be in touch with details on how they can help.